I barely notice the seven EKG wires trailing from under my shirt to the transmitter clipped at my waistband as I step down a metal staircase. There, one level below the instruction room, a gleaming white centrifuge dominates the space. The massive central hub’s 25-foot arm, holding an angular, gimbaled capsule, is still. I have already watched, through the instruction room’s window, fellow volunteers in this medical experiment take their simulated spaceflights, whirling within the warehouse-like chamber at the National Aerospace Training and Research (NASTAR) Center in Southampton, Pennsylvania. Our group of 11 volunteers is participating in a study funded in part by the Federal Aviation Administration and conducted by a team from the University of Texas Medical Branch to evaluate methods of preparing ordinary people for suborbital spaceflight as tourism companies like Virgin Galactic prepare to offer service. When I saw the call for volunteers in the SpaceDaily.com newsletter six months ago, I felt a tingle of excitement. I’ve been fascinated by human spaceflight since my early teens, when the Mercury program dominated the news. Today, as a 69-year-old grandmother, would I have the nerve to experience astronaut-level G-forces in a centrifuge? I wanted to find out. After signing up, I completed a stack of medical and psychological questionnaires. I was given a standard physical and a heart exam. Finally, I was approved for participation. Now, with a mixture of mild apprehension and almost giggly exhilaration, I’m climbing into the centrifuge gondola. Rebecca Blue, a doctor with the research team, shows me how to fasten and unfasten the straps of the five-point harness, which are twice as wide as my car’s seatbelt. She pulls the straps snug and adjusts my lumbar support, head support, and foot rests. She points out cabin details like adjustable air vents, the video display that simulates a windshield view, and—just in case—the location of the barf bag. Then she backs out of the gondola and closes the door with a heavy, metallic clunk. Suddenly it’s real. The centrifuge eases up to idle speed, and after a short countdown, accelerates until I feel 2.2 Gs for 10 seconds—just a preview run—and then slows back to idle speed. Not bad. The flight controller chimes in, asking if I’m ready to go to 3.5 Gs. The thought of feeling as though I weigh more than 400 pounds is a bit daunting, though I know I will experience greater G-forces tomorrow. Still, I’m comfortable, so I say “Yes.” I feel myself being pushed down in my seat, but it’s not painful. I’m glad the ride doesn’t feel like I’m spinning in circles. It just feels like flying. Fast. The morning’s training session prepared me well for this first run. The instructors went over the procedures thoroughly, using a light tone that took the edge off whatever tension we volunteers were feeling. We learned that Gx forces (front to back, through the chest) affect the body differently than Gz forces (head to toe). Gx forces make it harder to breathe, so we practiced breathing slowly, deeply, and evenly, pursing our lips to exhale. Gz, on the other hand, pushes blood down and away from the brain, and can cause one to gray out or get tunnel vision. To prevent this, we were taught a couple techniques to force blood back to the brain. The “anti-G straining maneuver” pushes blood up from our legs and hips. We sat straight and tightened our thighs and hamstrings. Then the doctor—we were told to call her Becky—said, “Imagine you have a walnut. That walnut is now located between your bum cheeks. Crack the walnut!” We watched each other pop upward in our seats and stay there as we held the squeeze. Hearing about the many ways to suffer under the pressure of G forces increased my apprehension a little, but learning how to handle them gave me confidence. I withstood the Gz forces in my first run without needing either of the maneuvers we practiced. (The capsule is rotated to different angles on the end of the centrifuge arm to create Gx versus Gz forces, or a combination of the two.) The experience left me curious about my second centrifuge run, when I would find out what Gx forces feel like. 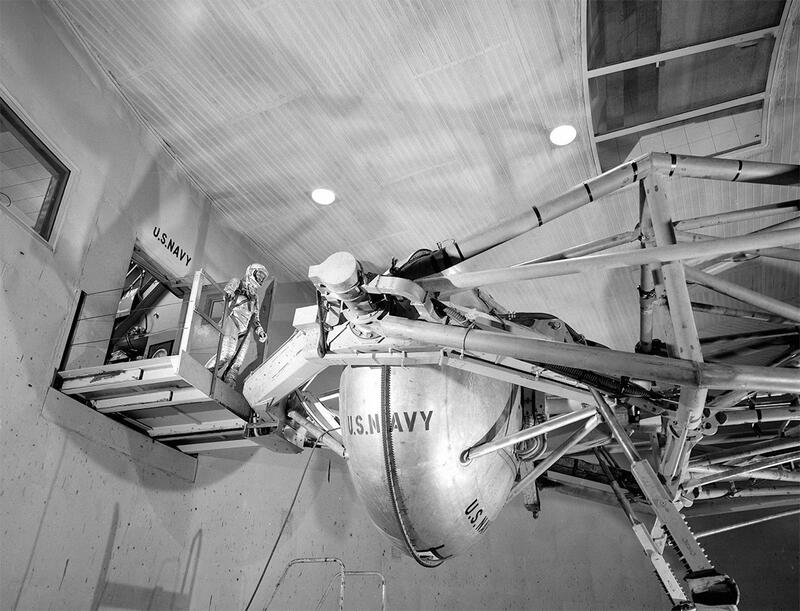 For each run, the volunteers take their turns in order of decreasing height, which makes it easier for Becky to adjust the capsule seat to fit each person. I’m next to last. While we wait for our turns, we can watch an eerie gray, infrared live video of the volunteers inside the capsule, their faces occasionally straining as they experience their flights, or we can watch through the window as the centrifuge whooshes around. We are strangers with a common fascination, and our backgrounds are wide ranging. I’m a space reporter and author. There’s a U.S. Air Force flight surgeon who has performed medical experiments during periods of weightlessness in NASA’s “Vomit Comet,” a KC-135 that flies parabolas. 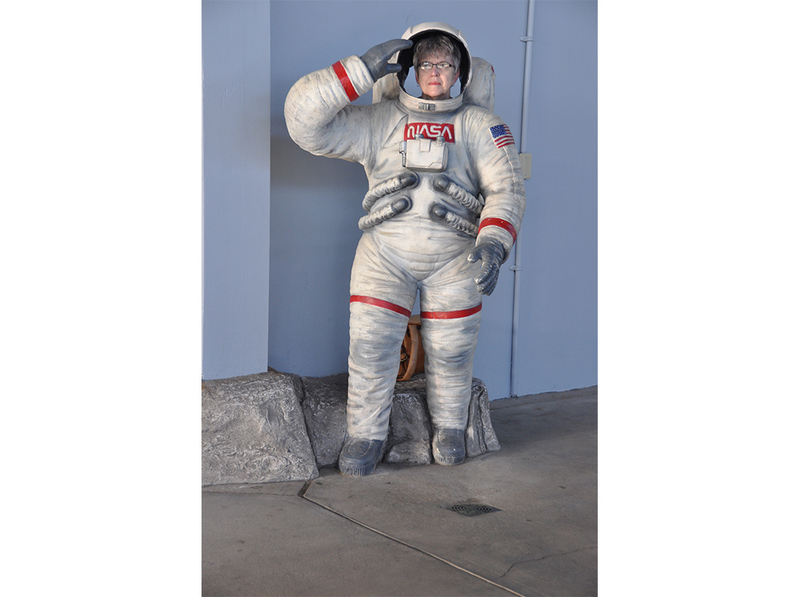 There’s a married couple who signed up to experience “spaceflight” together. Now it’s my turn for the second run. I climb into the gondola anticipating 6 Gs pressing against my chest. Apollo astronauts experienced 4 Gs during launch and about 6.7 Gs during reentry. As in the first run, the centrifuge spins up relatively gently, pressing me back with 1.4 Gx. 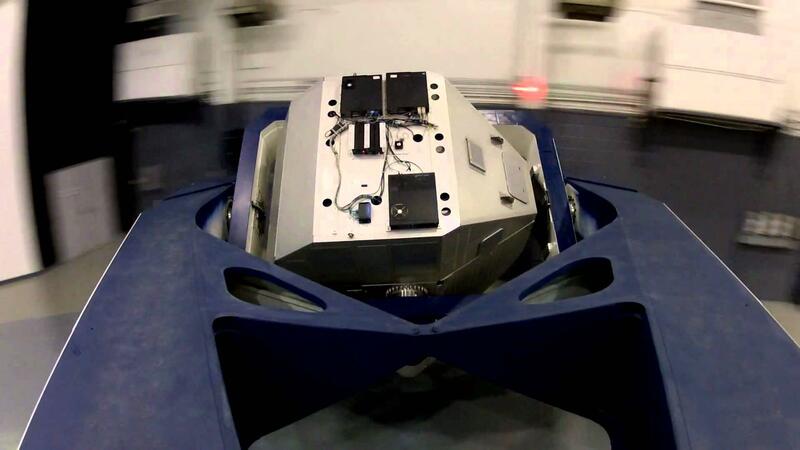 After a three-second countdown, the centrifuge accelerates. In five seconds, I’m feeling 3 Gx. It takes more effort, but I can still breathe without opening my mouth. After 10 seconds, it’s back to idle speed. The flight controller asks if I’m ready for the full-force experience, and I respond with a firm “Yes.” Another three-second countdown, and during the next 12 seconds, I rapidly ramp up to 6 Gx. Okay, now there’s a baby elephant on my chest. I inhale forcefully through my mouth and purse my lips to exhale, keeping my breathing slow, deep, and even. Ten seconds later, the centrifuge begins to slow, and I am amazed at what I just experienced. I handled 6 Gs just fine. As day one ends, Becky reminds us to take the EKG leads off before bed tonight so our skin won’t get irritated. We’ll get new ones tomorrow before the full simulations of the suborbital spaceflight that a few private companies will soon be offering. As we’re about to leave for the day, she says, “Don’t be surprised when you’re exhausted. You worked hard today, whether or not you realize it. Get some sleep tonight.” She’s right; I fall into bed early. Today, it’s our group’s turn. Virgin Galactic isn’t involved with this study, though, so we will simply experience “a simulation of a winged vehicle that is carried to altitude under a mothership, launches under rocket power, and lands like a glider,” says Becky. “Some of you may get randomized to a group that will do an emergency scenario.” This time we don’t get to watch one another on the video screen, so as not to spoil the potential excitement, or skew the test results. There’s a bookcase in the room with aviation and space books to browse while we wait. Some of the volunteers busy themselves with smartphones or tablets. We chat a little, but our nerves keep us mostly focused on anticipating our own turns. The centrifuge comes to a stop, and the flight controller asks me the same questions he does at the end of every run: “During that flight, did you have any discomfort?” No. “Any pain?” None. “Any difficulties breathing?” Not really. “How does your heart feel?” Good. “Did you have any visual effects on that flight?” None. “Any dizziness?” No. “How does your head feel now?” Fine. One or two people in our group report mild tunnel vision, which they easily counteracted with the techniques we learned. The flight controller asks if I’m ready to go on to the full-force flight. I take a deep breath, ignore the internal butterflies, and reply with what I hope sounds like a confident “I’m ready.” The rocket engine ignites and 10 seconds later I’m feeling 3.5 Gz pushing me down. Then the downward forces wane and the pressure on my chest builds to 2.7 Gx. It really feels like I’m blasting off into space. There’s no pain, but the pressure is intense. The “weightless” portion of the flight lasts only two minutes, rather than the three to five a real flight would entail. During reentry, there’s no Gz, but I get a full 6 Gx. 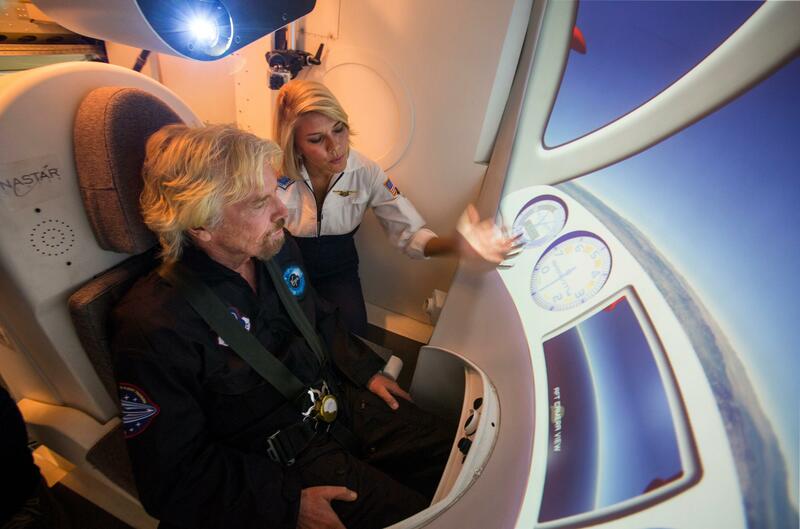 By the end of the flight, I feel like I could shake Richard Branson’s hand in gratitude. It’s exhilarating. We take a lunch break and come back for the final session. There is no mothership this time and no half-strength preview. The jet-powered spaceplane takes off from a runway, climbs rapidly to 40,000 feet, and shifts to rocket power. 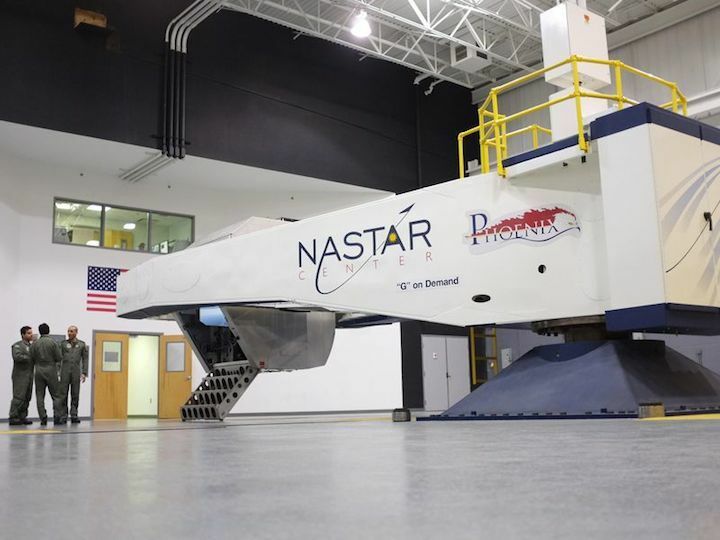 Unofficially, it mirrors the flight the XCOR Lynx might one day take, but that spaceplane’s development has been on hold since last year, and the company is also not involved in the NASTAR training research. Having watched others take this ride, I know that for the first part of the flight only the gondola moves, rotating slightly in various directions. But inside, I feel exactly like I’m in an airplane taking off from a runway and flying through a couple of turns. Those gentle arcs make me queasier than any of the G-forces have. I hear the countdown to rocket ignition and the Gs come on quickly. I’m shoved down into the seat. Like the last flight, I feel 3.5 Gz build up, before giving way to 2.7 Gx. Forty seconds after ignition, a voice says I’m flying at Mach 3. As I reach 3.7 Gx, Becky pipes up over the intercom and encourages me to do an air pushup, moving my arms forward against the unseen force. I do, and the forces ease again. I’m quietly coasting through space. Another five-second countdown and reentry begins. G-forces build quickly, and after 15 seconds peak at 5.2 Gx and 3 Gz. I’m breathing deeply, exhaling through pursed lips, forcing air in and out of my lungs. Before I know it, the six-minute flight is over. As I wait for Becky to unlock the gondola door, I take a few deep breaths, sad that I’ve taken my last flight. Months later, I called John Watkins to compare thoughts about our experiences. Neither of us remembered anyone having significant anxiety or discomfort. He said that on the second morning, one woman in the group was worried she might be unable to withstand the G-forces of the final flight. But after seeing the rest of us enjoy it, she went ahead and was glad she did. John and I had different reactions to the flight dynamics. “The sustained G-forces were stronger than I imagined,” he says, “but I enjoyed them.” I enjoyed them too, but they weren’t as crushingly intense as I expected. “The [University of Texas Medical Branch] is doing groundbreaking work,” says Ken Davidian, program manager for the FAA’s Center of Excellence for Commercial Space Transportation. Between Virgin Galactic and Blue Origin and XCOR, he says, “commercial suborbital flights are a big deal…. This is very important research because it’s something that all the operators are going to want to know about.” Each company will need to design its own training procedures. “We’re watching an industry come out of pretty much nothing,” he says. Vanderploeg says that the results of the study I participated in are still being analyzed. But in a previous phase, “we verified that people who had well-controlled medical conditions, even though they may be quite serious, could not only tolerate the G-profile just fine, but enjoy it.” Furthermore, “we’ve seen some surprises in terms of level of training versus anxiety. It’s not necessarily true that the more training you get, the more anxiety suppression you achieve.” Perhaps some of us were born ready? Once commercial spaceflight becomes established, many more of us are going to find out.